We can think of light and dark as on a brightness spectrum. And yet curiously they also behave like a loop. Too much purity and we can’t integrate and drift into inertia and shadow. Too much darkness and we fall into the light. Another way we can see this is that the spectrum has infinity at both ends. The smoother path is not at the extremes. Rather than rejecting the darkness, we should seek the balance point. The dancer always risks falling, but it’s the balance that allows the beauty of the dance to unfold. Without dissolution, there is no opening for growth. The key is balance. We want to open the door but not take the whole building down. Enough dissolution to open things up, enough purity to move things along, while we maintain the vehicle to live it through. We’ve all seen how destructive anger can be. And yet, how powerful the lessons of tough love. If our mother hadn’t laid it on occasionally, we would not have learned important lessons. The same is true in nature. If destructive laws come to dominate, they destroy their own habitat (a role humans seem to be playing in many places). If creative laws get too strong, chaos reins. There is no stability. We want balance. Consciousness creates the container of space. The devata structure the vibrations in that space which leads to geometries, fields, and form. Come to the center and you come to balance. Not in pure light or pure darkness but in the middle. Even in the scale of size between the Planck unit and the size of the universe, humans sit in the middle. We are the balance point if we allow it to arise within. 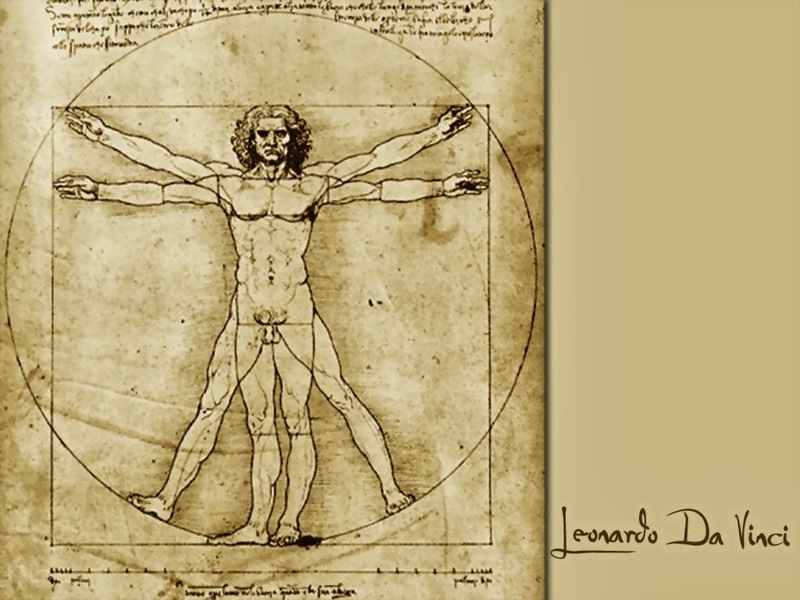 * Da Vinci’s Vitruvian Man illustrates the belly at the centre but energetically, the heart is. Tagged dark, light. Bookmark the permalink. So clear in theory. But can one find the balance point without fathoming the extremes? Is there progress without churning the Milk Lake? Good point, Herwig. I wouldn’t say we have to fathom the extremes but we may have to touch them so we have parameters. So we have a sense of what balance is. Nature moves toward balance so the art of practical application is in awareness of our nature aka spiritual development. By becoming aware of source, we integrate silence into our active experience, restoring balance and bringing us into the flow of life itself. It’s worth mentioning that the point of balance is not a fixed thing. The ebb and flow of life is in constant flux so there is a constant re-balancing. We experience this in all sorts of ways in day to day life. Stay up too late and we need more sleep. Don’t eat enough and we get ravenous. Because of this constant adjustment, the balance point is not something we’ll find with the mind. The mind may contemplate and come to understand this process but it’s by stepping into the flow of life rather than grasping and resisting that we come to balance more automatically. I’m also reminded of some comments in a video I saw recently. How we frame our life experience has a huge bearing on this topic. If we see things falling away as bad and things staying still as good, we can get stuck. We’re getting in the way of both progress and balance. balance, disintegration, growth, integration, and balance. Repeat. Growth requires dissolution. Trying to hold to a fixed balance point is folly. Static balance (staying the same) becomes inertia which leads to dissolution. But this is not in the direction of smooth growth. Mind doesn’t know what the new is on the other side of dissolution. Thus there can be fear and resistance to apparent loss. But if we see falling away as a step of evolution, a form of purification, it becomes something to be allowed. It makes the process much smoother and we can return to balance at a higher point of growth. Yesterday I hesitated to answer again, but this thing preoccupies me a lot on the collestive level. I suppose, I grew up and have lived in quite a different cultural and political environment than you or most people in North America. Yes, sure. But I have seen the physical, psychological and social consquences of a country falling into pieces and burning down. I and my generation have contributed a lot to further dismantling tradition and social structures, and the process is still going on, tearing apart a whole continent or more. Deep in my heart there has always been a conviction that all will be well in the end. But there is a wide range of possibilities what “in the end” could mean. On the individual level it is possible to overcome the fear of the unknown. But on the collective level something else gets involved. I might say, I am not afraid of me or my present ego dissolving, because experience shows that something new and fresh will be born. But it would be kind of weird to say the sama about you or even about whole populations, cultures …. At least it requires a lot of distance to do that. Yes, I’ve had the benefit of growing up in what one sage called “paradise on the wrong side of the world.” (from India) But I’ve also unearthed my deep memory so am very aware of prior times. This includes some truly remarkable periods and also, nasty times worse than anything at present. The key to me is context. The stuff thats arising in the collective these days is largely arising to balance and resolve the past. If it’s seen properly, theres an opportunity for healing. If not, it may be churned and made worse. Europe is experiencing the largest migration of people in known history. They are inevitably traumatized and from another culture. It will take a long time to sort and settle. But these machinations are all in the field of action, always moving towards balance. Behind all that is Divinity so yes, all will be well in the end. Further, we’re on an upswing in the cycle of consciousness. This leads to inevitable purification and rebalancing which is a lot of what we’re seeing now. The migration expresses this in multiple levels on topics like equality and distribution of wealth. So yes, in that context, some of what I say here is light platitudes. But there are other better sources for world events. Here, I seek more to inspire people so they move forward and don’t get caught up too much in the purification. I’ve written articles on collective evolution awhile back. The collective goes through similar stages to childhood development. And like adults, it can stall out in a stage common to many in the population. For example, you see some in a very tribal orientation. Other cultures are more individualistic. But with events making people feel less secure in places like the US, they’ve become more tribal again. But the key is – what is driving this regression? Change due to growth and purification. Thats causing short term fear and regression for some but its driven by a much larger collective movement of awakening. This is a huge change to even 10 years ago. We know it’s going to come out well. The question is how smooth the transition will be. Tomorrow I’m going on a unique retreat. This one is focused on a new technique to amplify the divine in the collective and to help with this process. I’m very curious to see what this can do. Will you share something from that retreat?